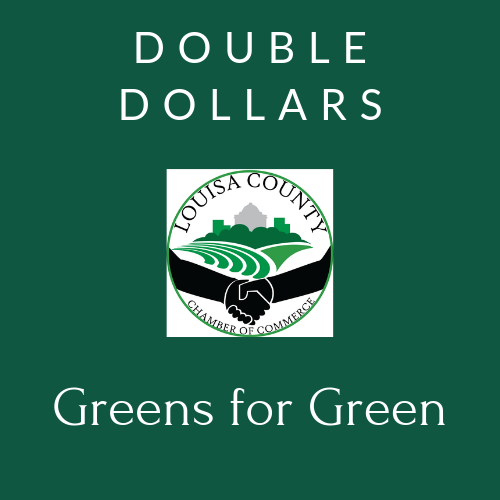 Help us achieve Double Dollars for the Louisa County Chamber of Commerce Greens for Green Scholarship Program. Our Greens for Green Golf tournament funds our scholarship program presented to a Louisa County High School student each year. The 2018 tournament added $750 to the scholarship. We're inviting our members to contribute to DOUBLE DOLLARS to increase the scholarship award to be presented in May. Please consider making a tax-deductible contribution to support this valuable program. If you wish to remain anonymous, please contact Tracy @ executivedirector@louisachamber.org to make arrangements for your contribution. We are currently seeking a review panel to determine the recipient for this year. If you'd like to be included, please reach out to Tracy Hale Clark, 540-967-0944. April 30 is deadline for all contributions. Review panel will evaluate applicants between April 28 - May 5th.